This webinar will commence shortly. To hear the audio portion of this webinar, dial: 866.740.1260. The access code is: 6443400. If you’re experiencing. 1 This webinar will commence shortly. To hear the audio portion of this webinar, dial: 866.740.1260. The access code is: 6443400. 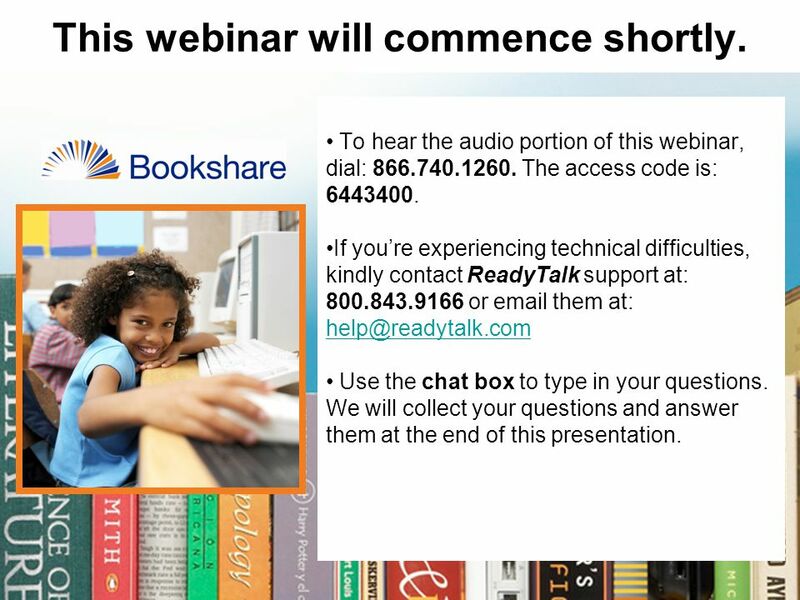 If you’re experiencing technical difficulties, kindly contact ReadyTalk support at: 800.843.9166 or email them at: help@readytalk.com help@readytalk.com Use the chat box to type in your questions. We will collect your questions and answer them at the end of this presentation. 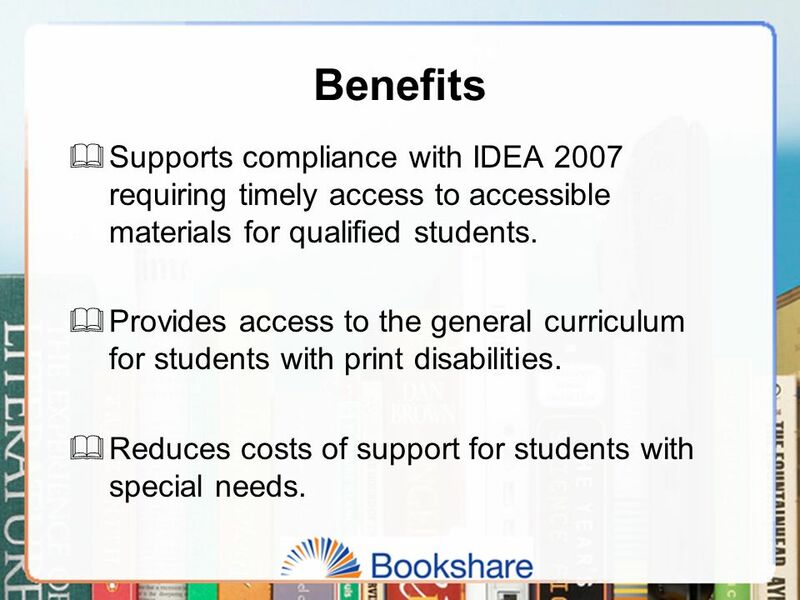 7 Benefits  Supports compliance with IDEA 2007 requiring timely access to accessible materials for qualified students. 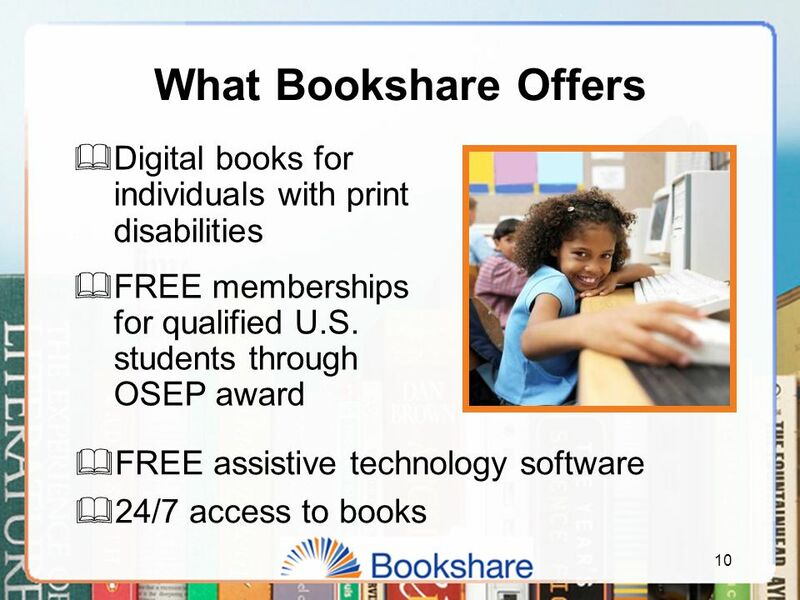  Provides access to the general curriculum for students with print disabilities.  Reduces costs of support for students with special needs. Download ppt "This webinar will commence shortly. To hear the audio portion of this webinar, dial: 866.740.1260. The access code is: 6443400. If you’re experiencing." Carol Leynse Harpold, MS AdEd, OTR/L, ATP. Definition Section Assistive technology device. Any item, piece of equipment or product system, whether. 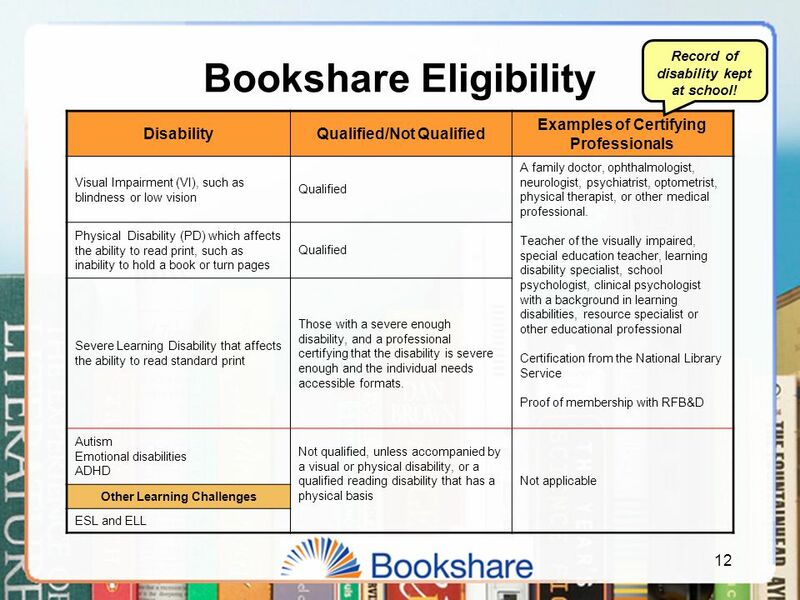 November 3, 2011 Bookshare at ORAHEAD Increasing the Availability of Accessible Materials and Textbooks for Postsecondary Students in the United States. DAISY 101 Gaeir Dietrich Director High Tech Center Training Unit of the California Community Colleges Co-chair DAISY in Higher Ed Working Group. Mary T. Lane, New Hampshire Dept. of Education Diana Petschauer, ATP, NHAIM Coordinator. 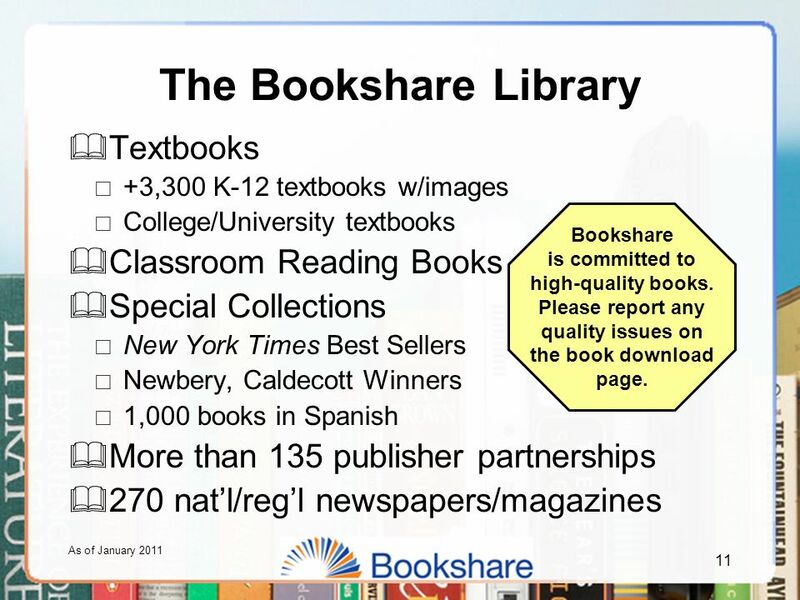 1 Reading Choices: So Many Ways to Enjoy Bookshare! Wisconsin AIM  Textbook Acquisition Wisconsin is an Open Territory State. Each local school district in Wisconsin selects curriculum. 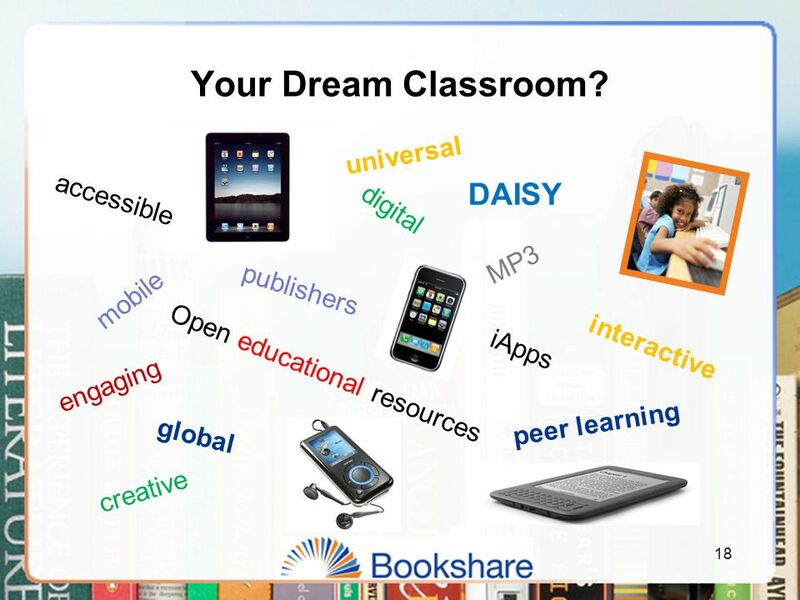 Hadley School Seminar What’s New at Bookshare? 1. 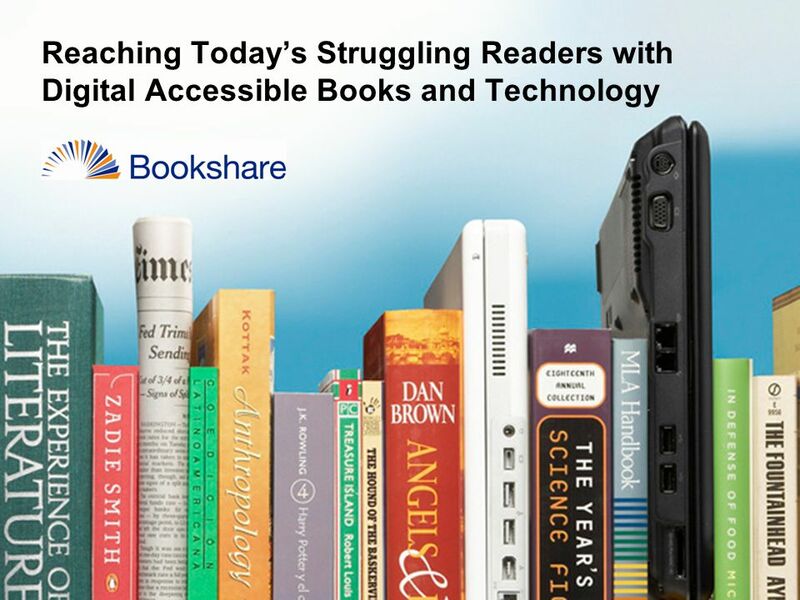 The Joy of Reading: Accessible Books from Bookshare. 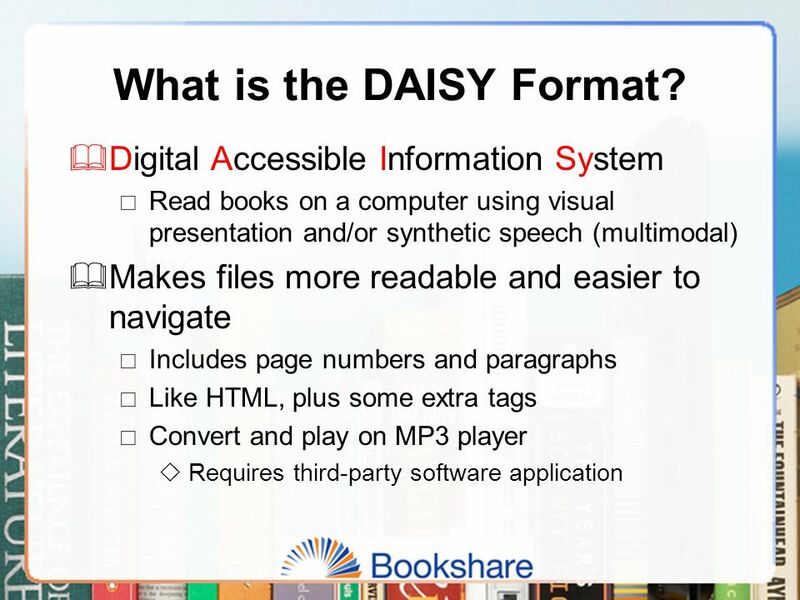 Mainstreaming Accessible Content through DAISY SPD-Microsoft Collaboration. 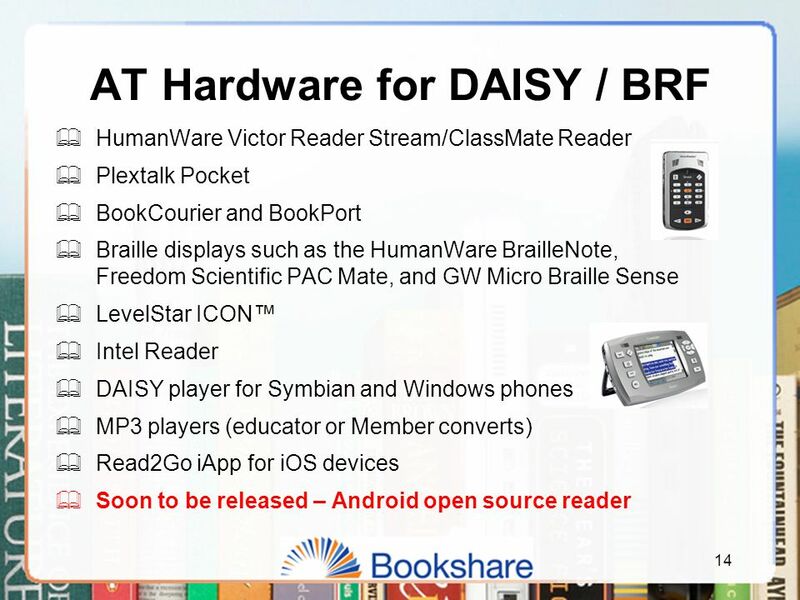 DAISY Playback Devices and Software Options: Unprecedented Access to Literacy through Assistive and Access Technology Joshua Irzyk, M.Ed. Teacher of the. 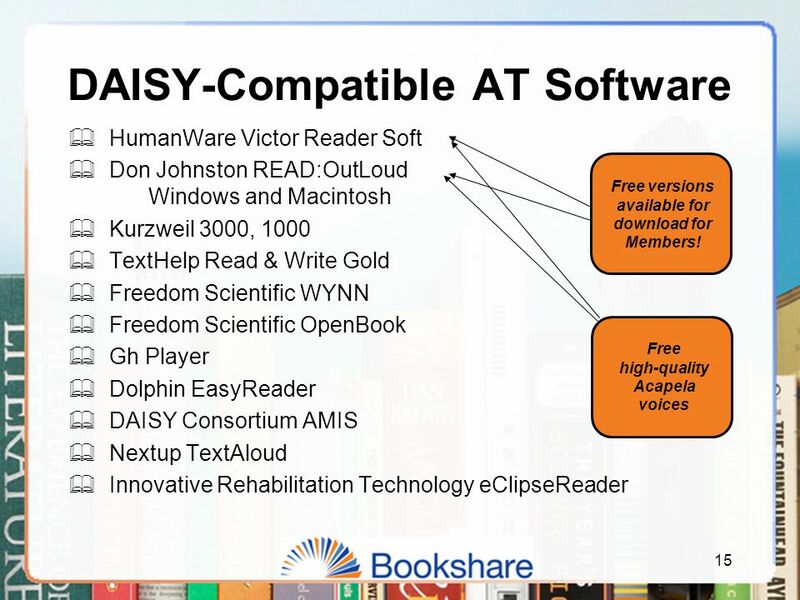 How to Download/Read Bookshare Books December 2011. 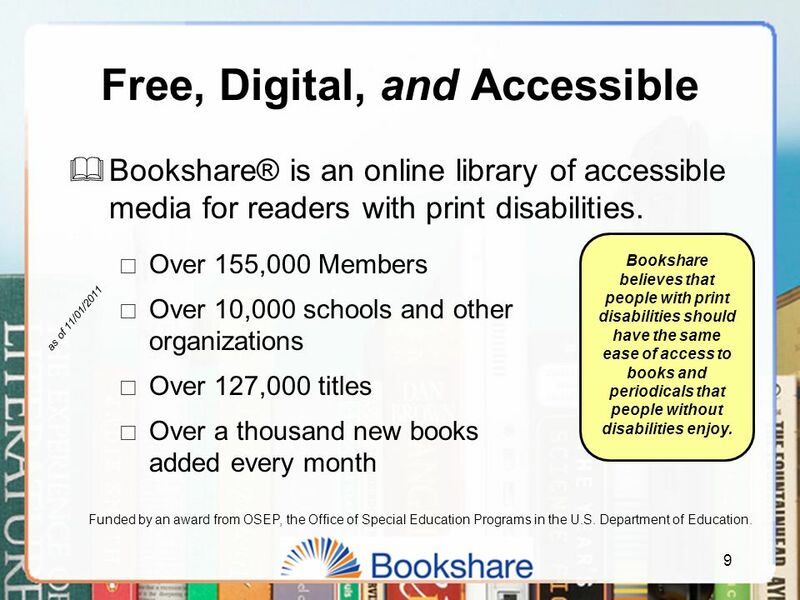 Bookshare.org The Digital Library Built by and for the Print Disabled Lisa Friendly Director, Bookshare.org Benetech *The Bookshare. The Evolving World of Digital Audio Books and Players South Carolina Assistive Technology Expo March 15, 2011 Presenters: Lee Speer, Clay Jeffcoat, and. 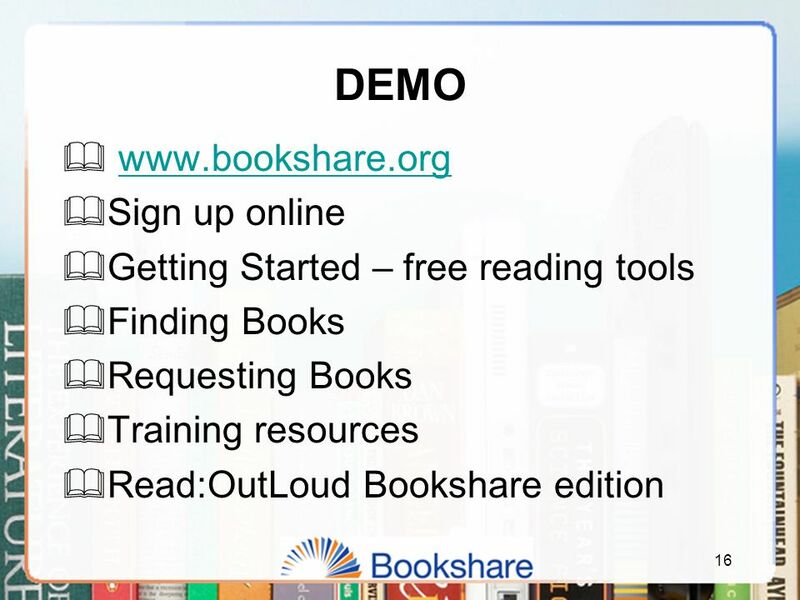 Bookshare 101 A hands on session to familiarize you with Bookshare and its procedures. 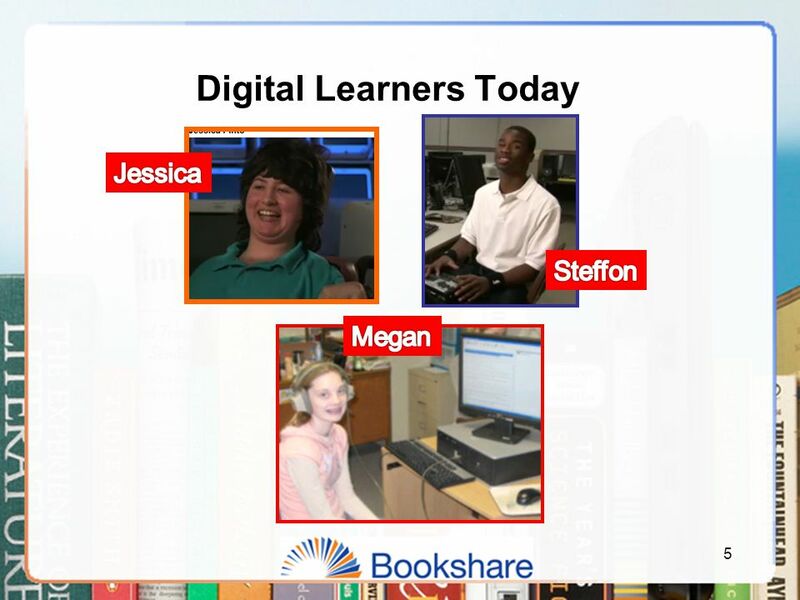 Trish Lopacienski, CCC-SLP ACT Team Leader FCPS Bookshare Primary. Reflections from the Café AEM Event – Part 2 Joy Zabala, Ed.D., Director of Technical Assistance Center for Applied Special Technology. Ronnie Connors and Kathi Tarrant-Parks I’m a Bookshare Sponsor: Now What Do I Do? 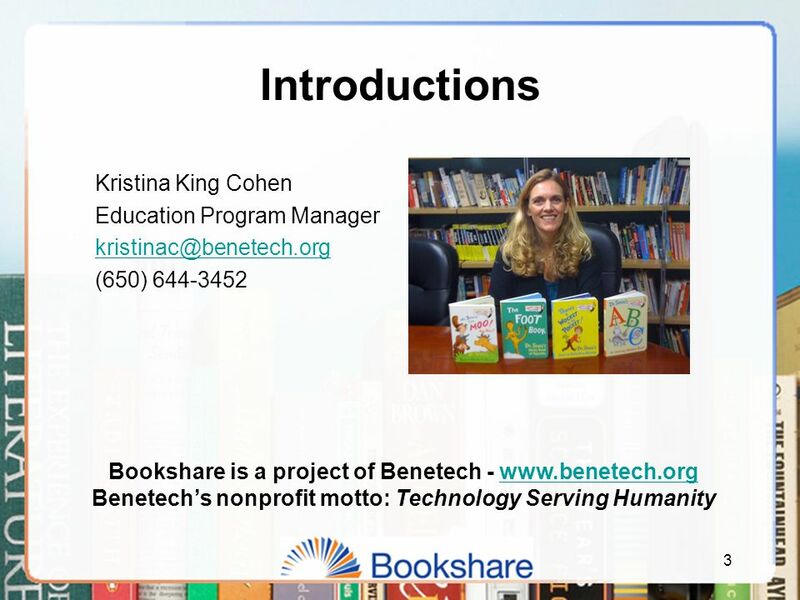 Bookshare Website Training Created with resources from 2. 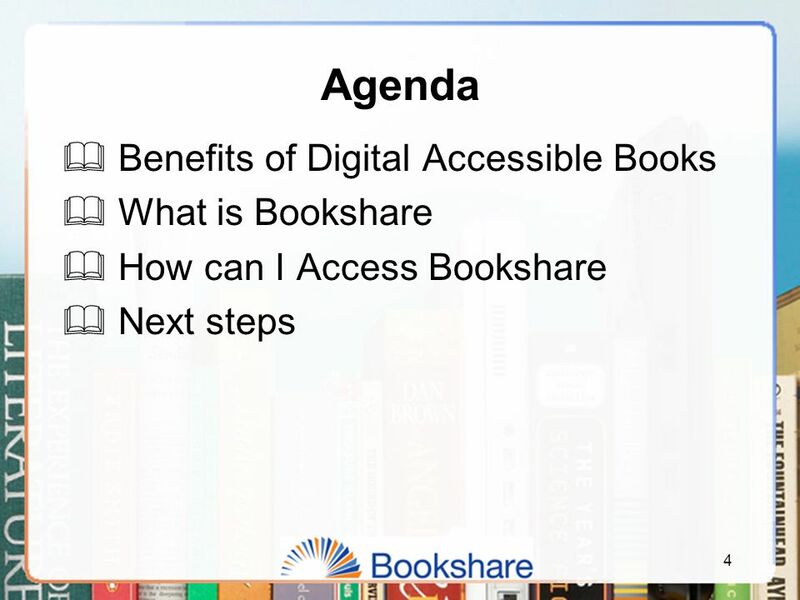 Bookshare: Books without Barriers December Why Do Students Need Books that Are Digital And Accessible? 2.